The Best Wrestling Podcasts from thousands of Wrestling Podcasts on the web using search and social metrics. Subscribe to these audio podcasts because they are actively working to educate, inspire, and empower their readers with frequent updates and high-quality episodes. Wrestling Podcast newsletter is a comprehensive summary of the day's most important audio podcasts episodes from the best podcasters on the web, and delivered to your email inbox each morning. To subscribe, simply provide us with your email address. Minnesota About Podcast Welcome to PW Torch Podcast launched by Keller Wade. This podcast features pro wrestling news, analysis and interviews. Facebook fans 5,612. Twitter followers 40,121. UK About Podcast WhatCulture Wrestling Podcast features the best insider perspectives, breaking news, interviews, discussions, quizzes and more related to Wrestling. Facebook fans 82,316. Twitter followers 33,766. About Podcast Welcome to The Steve Austin Show. He shares tales from his new life, unbelievable past adventures and also talks about pro wrestling. Facebook fans 21,219. Twitter followers 30,575. Toronto, Ontario About Podcast POST Wrestling features professional wrestling podcasts, news and reviews from John Pollock and Wai Ting. Facebook fans 1,361. Twitter followers 4,640. About Podcast Solomonster Sounds Off is a weekly podcast talking all things about pro wrestling. It tackles the good, the bad and the ugly from the world of pro wrestling. Facebook fans n/a. Twitter followers 25,786. United Kingdom About Podcast Wrestle Talk's Wrestle Ramble is a weekly talk show about professional wrestling. It is presented by Francesca Wood and Adam Brown. Facebook fans 23,000. Twitter followers 35,417. About Podcast Ring Rust Radio is weekly professional wrestling podcast. This podcast features information related to wrestling. Facebook fans 1,506. Twitter followers 11,917. Raleigh, N.C. About Podcast NC State Wrestling Podcast brings you all the news related to wrestling..
Facebook fans n/a. Twitter followers 13,225. Illinois & Texas About Podcast The Voices of Wrestling Podcast Network features a number of thoughtful, in-depth and passionate pro wrestling, sports and pop culture podcasts. Facebook fans 1,622. Twitter followers 10,663. St. Paul, Minn About Podcast Welcome to Pro Wrestling Dot Net Podcast by Jason Powell and his team. They provides audio analysis of pro wrestling in this podcast. Facebook fans n/a. Twitter followers 30,960. About Podcast Konnan runs a fun show on Keeping It 100, with plenty of guests from his WCW days, and a lot of talk about the Mexican wrestling scene that other shows might not highlight as much or at all. Oklahoma About Podcast The Jim Ross Report features his candid opinions, special guests, and sense of humor on a fresh presentation on the all-new reports exclusively on Westwood One Podcast Network. Facebook fans 290,068. Twitter followers 1,684,161. About Podcast 6:05 Superpodcast is a podcast about classic pro wrestling, hosted by The Great Brian Last. About Podcast The Two Man Power Trip of Wrestling has become a strong content provider in the podcast medium. Hosts John and Chad conduct the most in depth interviews in the entire genre of Professional Wrestling. This podcast involves pro wrestling as well as relevant and upcoming large scale events. Facebook fans 1,494. Twitter followers 13,920. About Podcast Welcome to Cheap Heat by Peter Rosenberg and Stat Guy Greg. They break down pro wrestling on a show that can only be described as the world's first MAJcast. London About Podcast Simon Miller's Pro-Wrestling Podcast gives you updates regarding to WWE, Impact, ROH, NJPW, NXT and more. Facebook fans n/a. Twitter followers 65,719. Australia About Podcast Welcome to Wrestle Radio Australia Podcast by Todd Eastman. Facebook fans 1,573. Twitter followers 1,250. UK About Podcast When Wrestlers Act podcast features pro wrestlers appearing in TV shows and movies. Facebook fans 42. Twitter followers 4,126. About Podcast Welcome to Going In Raw Podcast by Steve and Larson. They brought both their brand of humor and insights to every episode. They share their passion for wrestling. Facebook fans n/a. Twitter followers 19,044. Georgia, USA About Podcast Tapped Out Wrestling Podcast discusses Pro Wrestling and Sports Entertainment that includes WWE, Raw, Smackdown Live, NXT, Impact Wrestling, ROH, Indy Wrestling, and interviews. Facebook fans 1,946. Twitter followers 8,018. About Podcast Tights and Fights is the podcast that covers pro-wrestling information. This podcast will examine every corner of the squared circle for your enjoyment. Entercom Radio About Podcast The Taz Show features topics in the world of pro wrestling, sports, entertainment and more. Facebook fans 122,307. Twitter followers 9,369. La Crosse, WI and Online About Podcast All Things Wrestling Radio features the world of Professional Wrestling, latest interviews, rumors and more. Facebook fans 434. Twitter followers 1,386. Arkansas, USA About Podcast Heels and Quads Wrestling Podcast covers current WWE/ROH/NJPW and independent promotions. It also features reviews of classic content and guests. Facebook fans 66. Twitter followers 1,605. Brooklyn, NY About Podcast Welcome to the Squared Circle Pit Podcast by Rob Pasbani, who explores the common ground between music and wrestling. Facebook fans 633. Twitter followers 313. London UK About Podcast A weekly radio series on London's 104.4 Resonance FM that welcomes the listener to the wonderful world of professional wrestling. To know more on this, subscribe with us. Facebook fans 247. Twitter followers 144. About Podcast Pancakes and Powerslams Podcast features weekly wrestler interviews, Interactive commentary and analysis of professional wrestling which include Raw,SmackDown Live, Impact Wrestling, ROH and more. Facebook fans 2,199. Twitter followers 323. Atlanta, GA About Podcast What Happened When is a major League Wrestling Podcast by Tony. Facebook fans 15,825. Twitter followers 26,325. About Podcast Welcome to E&C's Pod of Awesomeness by Adam Edge Copeland and Jay Christian Reso. They are teaming up once again for bringing you a podcast about wrestling industry and to share fun stories about life. Facebook fans n/a. Twitter followers 25,164. About Podcast Something to Wrestle with Bruce Prichard was launched in August 2016. It is an audio podcast that discusses topics, events, wrestlers and memorable moments through the lense of former WWE executive Bruce Prichard. Facebook fans n/a. Twitter followers 42,221. Sin City About Podcast Conversation with the Big Guy is a podcast released every week with pro wrestling superstar and author. They explore life challenges, controversial subjects, wrestling nonsense, nutrition, motivation and more. Facebook fans n/a. Twitter followers 1,524,076. About Podcast James Mark Cornette is an American podcaster, former professional wrestling booker, commentator, manager, and occasional professional wrestler. This podcast gives information about wrestling. Facebook fans n/a. Twitter followers 139,122. Los Angeles, CA About Podcast Welcome to Comedians of Wrestling by Dan Black. This podcast is an instant reaction to the developing storylines of the pro wrestling universe. Facebook fans n/a. Twitter followers 411. About Podcast Killing the Town is the first PHD class in professional wrestling booking, business, and backstage machinations. Facebook fans n/a. Twitter followers 6,735. Westwood One About Podcast Talk Is Jericho is one of the best wrestling podcast. Facebook fans n/a. Twitter followers 56,424. Atlanta, GA About Podcast Hear all about wrestling on 83 Weeks with Eric Bischoff and Conrad Thompson. Facebook fans 3,978. Twitter followers 19,257. About Podcast Sean and Al's Wrestling Podcast delivers the most interesting perspective on pro wrestling. About Podcast Wrestling Inside the Ropes Podcast features information related to wrestling, WWE and more. Chicago, IL About Podcast A weekly podcast from two fans of professional wrestling focusing on New Japan Pro Wrestling. This podcast talk about WWE, ROH, and Independent Wrestling as well. Facebook fans 14. Twitter followers 633. About Podcast PWPonderings Podcast covers wrestling results, upcoming shows, & discuss broad topics within indie wrestling. Facebook fans n/a. Twitter followers 9,561. About Podcast The Indy Corner Podcast features pro wrestling information. Facebook fans 2,417. Twitter followers 8,013. United States About Podcast Welcome to The Major Wrestling Figure Podcast by Join Matt Cardona and Brian Myers. This podcast features latest news, upcoming releases, toy history, vintage collecting and more. Facebook fans n/a. Twitter followers 6,153. Queens, NY About Podcast Don Tony And Kevin Castle Show features pro wrestling news and analysis, mainstream entertainment, news, sports talk, pop culture, and more. Facebook fans 8,236. Twitter followers 10,752. NY About Podcast Notsam Wrestling Podcast by Sam Roberts. He is a regular panelist on the WWE's Kickoff Shows, making appearances on events like Summerslam and Wrestlemania. Facebook fans 21,676. Twitter followers 140,418. About Podcast Welcome to Wrestling Soup by Anthony Missionary Thomas and Joe Numbas. They presents an entertainment show of professional wrestling, hot button topics, and more. Facebook fans 10,875. Twitter followers 15,263. About Podcast RBR Weekly Wrestling Talk Podcast has been the leader in quality wrestling talk shows, featuring all around knowledgeable wrestling chats. Facebook fans 1,098. Twitter followers 1,828. Chicago, IL About Podcast The Art of Wrestling by Colt Cabana. He travels all over the world as a full time independent pro wrestler. Facebook fans 16,418. Twitter followers 251,015. About Podcast Welcome to Ring Time Pro Wrestling by Keith and Keshia Holt. They love wrestling and want to share that with all of you. Techwood Drive About Podcast Welcome to the Old School Wrestling Podcast. This podcast is a project of old school wrestling fans Dre and the Black Cat. They share wrestling information with the rest of the world. Facebook fans 1,501. Twitter followers 1,450. About Podcast Bob Bamber presents a monthly wrestling and MMA podcast, reviewing shows and news from literally twenty years ago today. Manchester, NH About Podcast Welcome to the Wrestling Podcast About Nothing by Brian Milonas and Mike Crockett. Facebook fans 815. Twitter followers 2,493. Parts Unknown / PHX About Podcast The Steel Cage Network of podcast features weekly shows recapping the suite of WWE content which includes RAW, SmackDown Live, 205 Live, NXT, as well as everything. Facebook fans 5,799. Twitter followers 12,673. New York About Podcast Doing the Job Wrestling Podcast was hosted by Denny Lugz, Sean Spurge, and M2J. They do the job and put wresting over. Facebook fans 250. Twitter followers 316. About Podcast The Best Pro Wrestling Podcast is your weekly source for the best in professional wrestling talk. Long Island About Podcast Pro Wrestling Talk by Pro Wrestling Fans. Facebook fans 2,926. Twitter followers 9,595. Poughkeepsie, NY About Podcast Another Wrestling Podcast hosted by Credo, Angry Kuter & Minority Mike as they talk everything and anything in the world of pro-wrestling. Facebook fans 1,815. Twitter followers 21,615. About Podcast "Kings of the Ring" is a fictionalized dramatization of the 80's wrestling scene following the rise and fall of the power players of Pro-Wrestling. It's a wrestling scene, in and OUT of the ring, told as an Audio Drama Podcast with music, sound effects, and a full cast of characters. Facebook fans 409. Twitter followers 766. 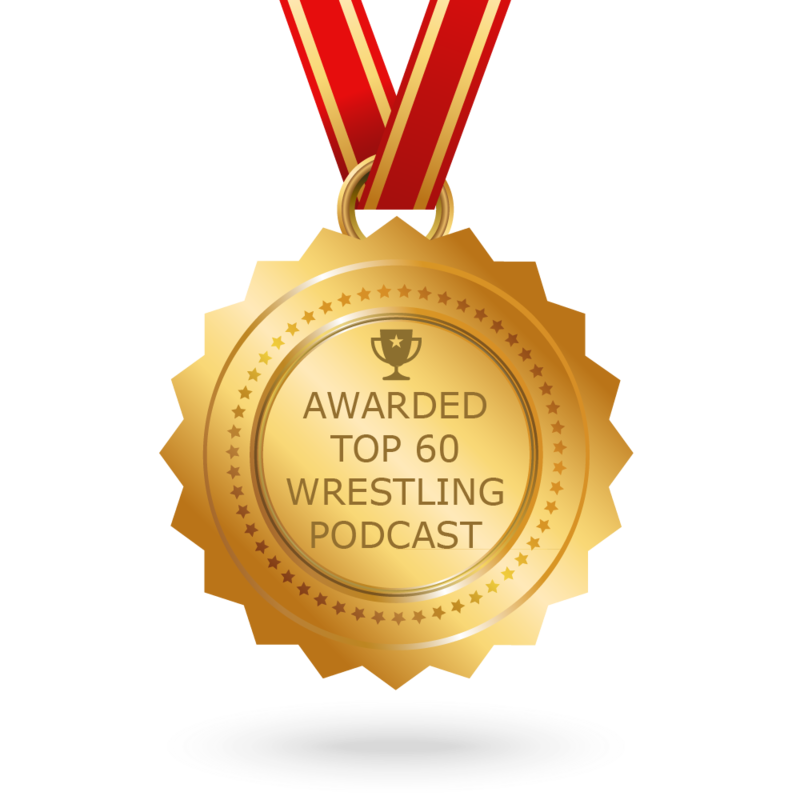 CONGRATULATIONS to every podcast that has made this Top Wrestling Podcasts list! This is the most comprehensive list of best Wrestling Podcasts on the internet and I’m honoured to have you as part of this! I personally give you a high-five and want to thank you for your contribution to this world.